This post is sponsored by Liberté Yogurt. All opinions are my own. Earlier this month, I introduced you to one of Liberté Yogurt‘s new flavors, Cappuccino. Today, I’d like to introduce another – Caramel. This yogurt is a delight with pure melted caramel and rich milk. Yum. This is without a doubt one of my most favorite yogurts ever. When you think of trifle, you probably don’t think of yogurt first, do you? But when I heard about Liberté’s new caramel flavor, trifle was the first thing that popped into my mind. And pears! Fresh, juicy pears. My next thought was of how I could combine that luscious, decadent Liberté caramel yogurt with fresh pears and put a little Southern spin on it. 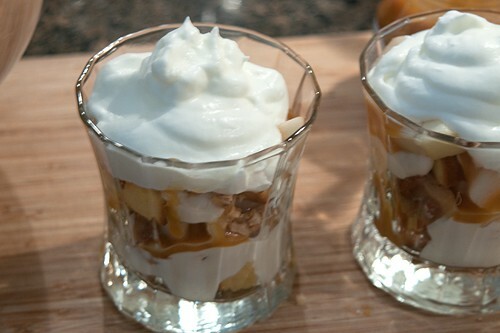 My solution was pound cake and peanut brittle resulting in this Pear and Caramel Yogurt Trifle. I used quite a few purchased ingredients for this recipe, but if you wanted to make them individually from scratch you could. I took a good quality purchased pound cake, cut it into slices, buttered it, cubed it and toasted it for a few minutes. The buttering and toasting only added to the richness of the cake. I also purchased some peanut brittle and a salted caramel ice cream topping. Those could easily be made in your own kitchen but I was all about saving time with this recipe. Preheat the oven to 350 degrees. Butter one side of each slice of pound cake and cut into 1” cubes. 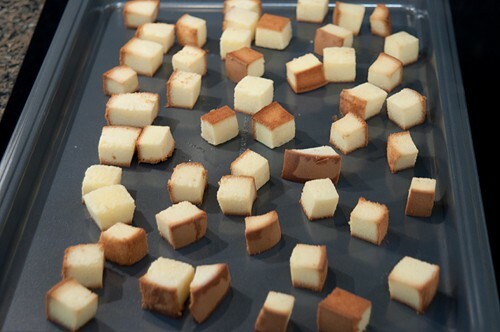 Place the cubes on a baking sheet and cook until lightly browned. Remove from the oven and cool. 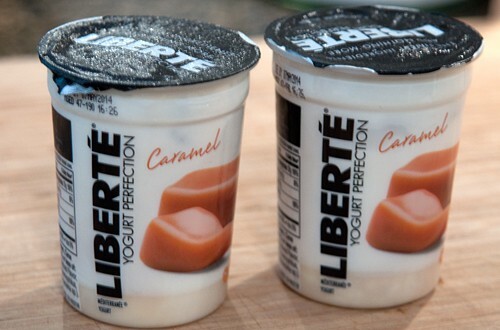 You’ll need two containers of luscious Liberté Caramel Yogurt for this recipe. You’ll also need to go ahead and peel and core the pears and cut them into cubes about the same size as the pound cake cubes. Whip the cream and sugar to soft peaks and break up the peanut brittle into pieces about the size as the cubes of the pound cake and pears. 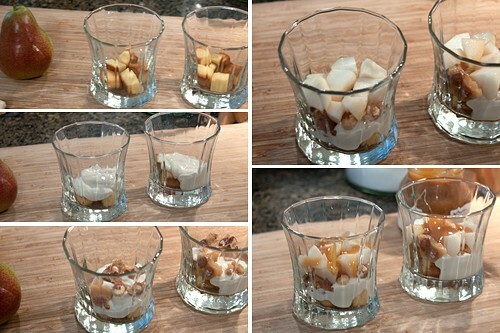 Using four individual serving glasses, make two layers beginning with the pound cake, Liberté caramel yogurt, peanut brittle, pears, and caramel topping. Layers of fresh pear, toasted pound cake, and caramel yogurt make a delicious non-traditional trifle. Preheat the oven to 350 degrees. 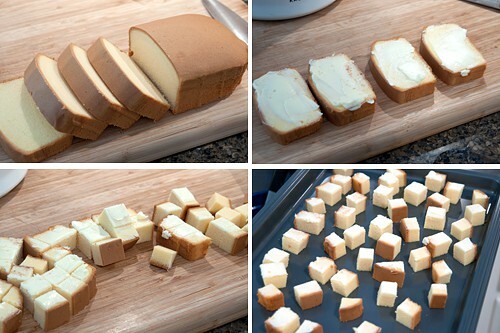 Butter one side of each slice of pound cake and cut into 1” cubes. Place the cubes on a baking sheet and cook until lightly browned. Remove from the oven and cool. Peel and core the pears and cut into cubes. Whip the cream and sugar to soft peaks. You’re welcome, Nikki! Your trifle looks so delicious. I’m anxious to try it! This looks so delicious! I love caramel and pears together! Me, too, Rebecca! Always a winning combination, I think. I could lick that glass clean!!!! I could definitely eat this for breakfast, right now. What a great mixture of ingredients. I love that you toasted the pound cake too! Thanks Ginny. Toasted pound cake is a southern thing that I’ve enjoyed all my life so I thought why not include it in this trifle. Worked great! This is such a cute dessert idea! I love the fresh pears and toasted pound cake combo. I’ll have to keep my eye out for the caramel yogurt. That sounds delicious just by itself! It is, Alexis! Really fantastic yogurt. Such a pretty trifle! I have a weakness for caramel..and peaches…well, for something just like this! Sounds quite divine, though I’d love it even more with ingredients made from scratch. i can never go past a good trifle, love that you used yogurt.. definitely perfect for summer. yum! Thanks, Thalia. The yogurt added a lovely richness to the trifle. 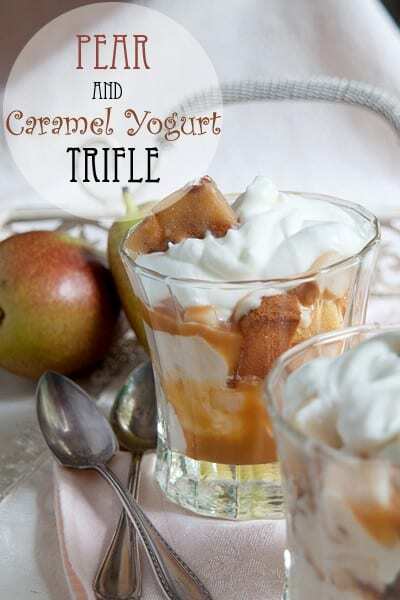 First off caramel yogurt just sounds decadent and delicious (and what a treat in the morning)! Then to make a trifle out of it? Yum! That looks like the most delicious thing that I have seen in a while. I offer a prediction that it will appear on my table in the near future! It is really, really good. How can you beat toasted pound cake, caramel, peanut brittle, and pears! Yes, they are a lovely combination aren’t they? I love how simple this recipe is. Perfectly proportioned for each person in their own serving glass! It does help with portion control, Connie! Otherwise, I’d be tempted to eat half the recipe. I love trifles. I am surprised that you don’t find them more often in restaurants—-probably parfaits would serve up better—and you don’t find those often either. I think they are super elegant. You bring one of those spectacular desserts out to flash your guests and I am sure one would be Queen for a night. What a great combination! I love this yogurt…it’s amazing. This really is the kind of dessert I love to make, especially when time is short, just pulling what I have in the fridge and pantry and turning it into a wow dessert! That’s what this is! And the possibilities are endless, depending on what one has on hand. Beautiful!